Andrew Slorance with younger children Olivia, left; Millie, right; and Finlay, top, on Iona. Cancer suffer Andrew Slorance is giving his backing to a bid to build a £1.2m extension to the Maggie’s support centre at Edinburgh’s Western General Hospital as a show of gratitude to the charity. 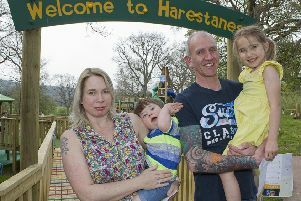 The father of five, originally from Hawick but now living at Liberton in the capital, was diagnosed with a rare blood cancer called mantle cell lymphoma in November 2015 and has often turned to the centre for help since then. Prior to his diagnosis, the 45-year-old was the fittest he had been in years after giving up booze, taking up cycling and losing three stone in weight. However, his wife Louise, 40, noticed he had been sleeping more than usual on a family holiday, so the discovery of a pea-sized lump in his groin prompted him to see his GP. Within days, doctors discovered he had incurable blood cancer, and it had already spread to his intestines. Andrew, formerly a journalist with our sister paper the Southern Reporter and now a communications manager for the Scottish Government, underwent six rounds of chemotherapy and a stem cell transplant to fight the disease. Throughout his treatment, Andrew has been supported by the Maggie’s centre, particularly to help explain to his youngest children – Millie, nine; Olivia, seven; and Finlay, five – what is happening to their dad. Another of our sister papers, the Edinburgh Evening News, has teamed up with the charity and fundraiser Lisa Stephenson to try to raise the £1.2m needed to pay for an extension to the centre, and former Hawick High School pupil Andrew is backing that campaign all the way. The appeal has already passed the halfway mark, thanks to a £160,000 donation from the supermarket chain Morrison’s, putting Maggie’s a step closer to its goal of seeing an extra 5,000 patients a year. He was particularly worried about how Olivia and Millie would cope with the news as both girls had both struggled with forms of anxiety. Andrew, born and brought up in Hawick but a resident of the capital since the 1990s, said: “We didn’t want to hide things, but we wanted some advice on how to deal with them. We felt Maggie’s might be able to offer us something there, and boy did they deliver. “The kids knew daddy had cancer. They knew I was popping in and out of hospital, and they knew I had stopped work. “All of this was a big change for them. “Maggie’s was hugely motivational for me and hugely beneficial for my family. “For the children in particular, it has played a massive part in helping them deal with what could have been a hugely challenging year. “When they see it on TV or in the paper, they ask if it is our Maggie’s. “Children shouldn’t enjoy a place associated with cancer, but my children do because they get something precious out of it. “The building provided them with a sort of sanctuary where they could go have a wander, go have a nose, get a bit of peace and quiet. Andrew is now in remission and has returned to work on a part-time basis, as well as planning to add to the £6,500-plus he has already raised for Maggie’s by doing a three-mile sponsored run between bouts of chemotherapy. “I’m not daft. I know it will return at some point, but I take a positive outlook,” he added. “This has been part of the discussions I’ve had at Maggie’s, about not panicking if something doesn’t feel right.